OK, I don't know who amongst you remembers All Dogs Go to Heaven--but there's this one scene where the little girl eats a bunch of waffles. And they look like the best waffles you've ever seen. 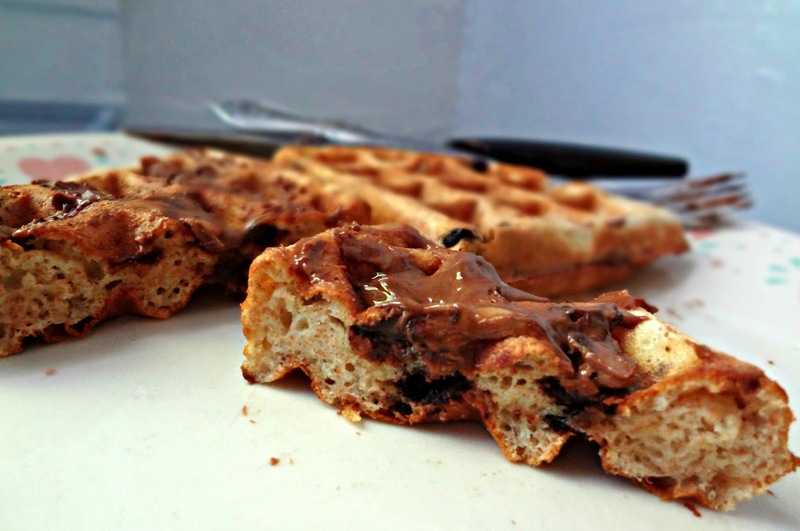 These waffles blow those waffles out of the water. These waffles are not only pretty healthy (whole wheat flour and canola or coconut oil! )-but they are the best waffles I've ever had! The outsides are perfectly crisp and inside they are fluffy and wonderful. 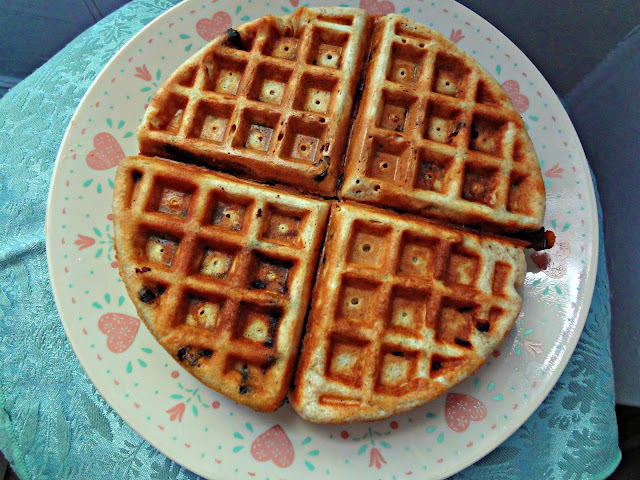 And, I threw some chocolate chips in mine because that's how I roll (Michael's were plain-he eats waffles like a normal person with butter and syrup. I eat mine with peanut butter on top). On a somewhat unrelated but still waffle-centric topic: There's a fried chicken and waffles place that I passed today, near where I live (it's called "Bubba's"...hehe): I've always been curious about that chicken/waffle combination-have any of you tried this before? Is it good? Does it somehow make sense and then did you wonder how you ever ate them separately, or is it just kind of a strange juxtapositioning of two foods you like? Slightly adapted from Barbara Bakes' "Light and Fluffy Whole Wheat Waffles"
Makes about 4 Belgian waffles and 18 regular waffles. Beat egg whites until the hold stiff peaks. 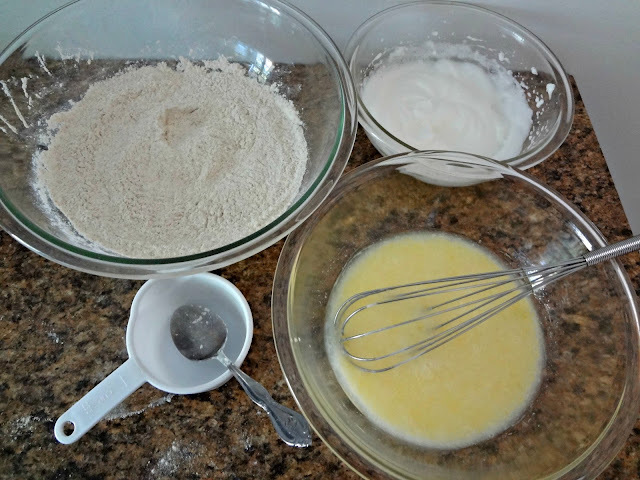 In a large bowl whisk flour(s), baking powder, and salt. In a small bowl whisk together milk, oil, and egg yolks. Then, gently fold the egg whites into the batter. 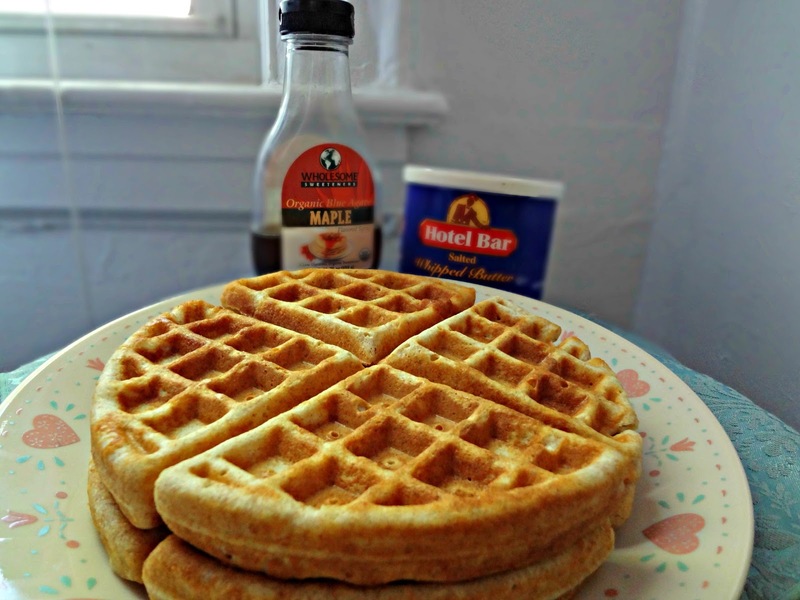 Bake in a waffle iron until golden brown.